After five rounds of the Turf 2 season, it seems to be all about the three Narre’s, who occupy the top three spots in the ladder…and by a fair margin. The top of the ladder Narre South hosted Dandenong West at Strathaird Reserve in a one-dayer on Saturday, and got off to a blistering start courtesy of openers Morteza Ali (60) and Jakeb McVicar (34). But, the Westers fought back admirably to grab the scalp of McVicar and end the 67 run opening stand, before snaring the key scalp of Jonty Jenner without troubling the scorers. Eventually, the class and experience of the Lions’ middle order took its toll on the Westers, with skipper Scott Phillips (78 not out) putting the visitors to the sword with a brutal knock that included four maximums. Rumesh Reangana (41) and Ashan Wijayakumara (29) also got involved, as the home side posted a mammoth 5/277 in 40 overs. Seamer Tim Phillips (1/24) struck early to remove Nathan Power, and despite an entertaining 40 by Karthik Nadadur, the Westers could only muster up 9/172 in their 40 overs. McVicar (2/24) was once again impressive with the ball, with Jonty Jenner (2/24) was the other to take multiple wickets. The win sees the Lions undefeated after five rounds, sitting six points ahead of second on the table. Second placed Narre North also snared a key win, holding off a dangerous St Brigid’s/St Louis at Narre North Reserve. Off the back of a sublime 91 to Rams’ opener Josh Henry, the home side posted a competitive 6/182, but with the visitors’ quality with the blade, it was certain to be an entertaining chase. It seemed destined that an upset was brewing despite losing an early wicket, with Tyler Brodie (38) and Vaib Deshpande (54) putting on 101 runs for the second wicket, but the key scalp of Deshpande proved to be the downfall. With Ryan Hendy (3/33) and Kyle Hardy (4/28) working their magic, the visitors couldn’t handle the heat, and were ultimately bowled out for 175, just eight runs short. And the third Narre – Narre Warren – held off Cranbourne to continue its impressive recent form at Casey Fields. 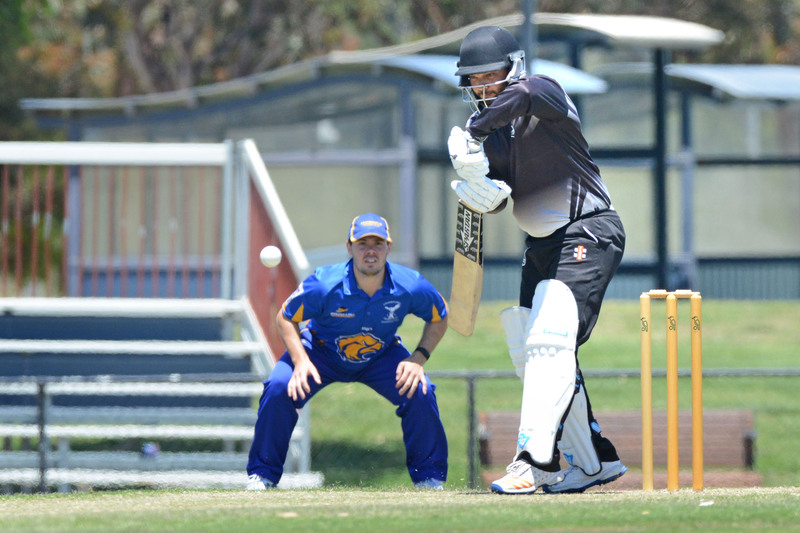 The Magpies were in a strong position at 3/105 after strong hands by Zach Allen (48) and Janaka Liyanabadalge (36), but an excellent bowling display from Jordan Margenberg (4/25) and Pardeep Boyal (3/23) saw the visitors rolled for 162. Martin Kelly steams in for the Eagles. 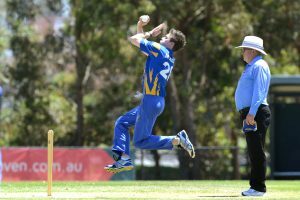 In a chase that ultimately could have gone either way, the Magpies showed enough composure with the ball – largely through the efforts of Ben Ingham (3/21) – to restrict the home side to 9/146 in their 40 overs. Skipper Matt Blackman top scored with 28 for the Eagles. And in the final game of the round, Parkmore Pirates also managed to stave off a surging Dingley at Souter Oval. The Pirates notched up an impressive 6/197, off the back of gun batsman Aditya Ganesh’s 55, and the Dingoes fell just short, finishing on 9/189, with skipper Corey Booth (43) enjoying some strong form. Round 6 action on Saturday will see another one-day match, with a blockbuster clash between Narre North and Narre South set to draw plenty of interest. It can’t be underestimated, this was a massive win for Keysborough, and will bring on plenty of confidence out of Rowley Allan Reserve. Keysie knocked over ladder leaders Beaconsfield in a brilliant display of cricket on Saturday, in a low scoring belter. Batting first, the Tigers struggled to work their way to 7/132 off their 40, with the home side’s disciplined bowling group managing to curtail the threat that is Matt Golding, Kevin Baldsing and Jack Benbow in the middle order. The home side quickly found themselves in a spot of bother at 5/44, with Callan Tout (5/19) ferociously rummaging through the top order, and it seemed that the Tigers would once again firm as winners. But, Cameron McLeod (57 not out) had other ideas, defying the wickets tumbling around him – including a hat-trick to Matt Golding (4/27) that saw them fall to 8/88 – to pull off an absolute stunner of a win. At 9/114, McLeod and tail-ender Daniel McConville (three not out) held their nerve, knocking around the runs as the Tigers desperately tried to obtain the match-winning wicket. But the home side found the runs, in an important win for the club that has them second on the ladder coming into Christmas. Coomoora were also big winners coming out of the round, dominating Lynbrook at Marriott Waters. The Kangaroos raced down the Lakers’ first innings total of 126 with ease, picking up the win in just the 33rd over and with only wicket down. Rahoul Pankhania (56 not out) picked up his first half-century of the season, while in the first innings, gun bowler Malan Madusanka (3/21) did the bulk of the damage. Fountain Gate, meanwhile, picked up a win against Lyndale at Max Pawsey Reserve. The Gaters racked up 6/164 off their overs, with Justin De Wet (46) doing a fine job at the top of the order, while Don Ranawaka (3/22) bowled well for the Pumas. In reply, the Pumas couldn’t recover from two early wickets, and ultimately finished on 9/131 off their 40 overs. And Parkfield capped off the Turf 3 round with a complete performance against Silverton. The Bakers were rolled for just 70 in the 30th over, with Roshane Cooray (3/13) and Nico Jeffery (2/8) bowling brilliantly for the Bears. The Bears had a minor stumble, falling to 3/38, but Rukshan Muthukuda (nine not out) and Shane Cooray (24 not out) guided the visiting team home with ease.